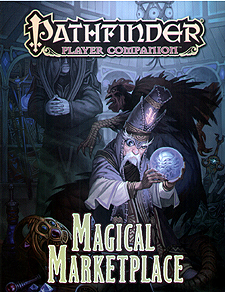 Gather your gold and get ready to upgrade your gear with Pathfinders Player Companion: Magical Marketplace! The merchants of Golarion have honed their skills for years, plumbed ancient sites of legend, and made deals with otherworldly forces to dredge up miraculous magic items saleable to intrepid adventurers such as yourself. From the opulent boutiques of the Ivy District in Absalom to the bustling black markets of Katapesh's Nightstalls, the shopkeepers herein stock a wide range of magical items useful to adventurers of any walk. Whether you seek to poison enemies with a mere gesture, walk the ocean floor in search of plunder, shatter bones with magical hammers, or enhance your body with clockwork prostheses, these dealers are sure to offer the key to your success. In addition, these practiced merchants each offer a host of unique and useful abilities to teach their favoured and frequent customers. Over 50 new magic items, including enchanted tattoos, drow devices, insidious traps, holy relics and more. New special weapon and armour abilities designed to help cripple enemies and ward against their devastating attacks. Dozens of new rules options for every class, including feats, spells, inquisitions, hexes discoveries and more. This Pathfinder Player Companion is intended for use with the Pathfinder Rolelaying Game and the Pathfinder campaign setting, but can easily be incorporated into any fantasy world.